We’d love your help. Let us know what’s wrong with this preview of Silk by Alessandro Baricco. To ask other readers questions about Silk, please sign up. I'm not ashamed to recognise this is one of the most mesmerising books I have ever read, every single image described has stayed with me for years...anyone else? Kevin I can understand your fascination with the book. I only discovered it yesterday and devoured it in one sitting. What is the ending of the story of silk Alessandro Baricco? "لو ضغطت عليها بقبضة يدك لانتابك شعور بأنك لا تمسك شيئا بأصابعك‎"
I never imagined I would like a book where the main character makes a living by buying silkworms. But I did. In fact, I not only liked it, I loved it. SILK is easily one of the top ten books I have read in the past eighteen months or so. It has a sparse writing style, and passages are repeated almost verbatim in no less than three different spots. The characters are there, fully realized, but at the same time, each character is a mystery or a ghost without definite shape. The prose is smooth, dr I never imagined I would like a book where the main character makes a living by buying silkworms. But I did. In fact, I not only liked it, I loved it. SILK is easily one of the top ten books I have read in the past eighteen months or so. It has a sparse writing style, and passages are repeated almost verbatim in no less than three different spots. The characters are there, fully realized, but at the same time, each character is a mystery or a ghost without definite shape. The prose is smooth, dreamlike. SILK is an easy story to relate to: it is about the idea of love. Herve Joncour is a silkworm buyer who, at first, travels across Europe, past the Mediterranean, into Syria and Egypt to buy the precious silkworm eggs. However, an epidemic hits the silkworms of Europe, and before long, the epidemic spreads to the far reaches of Egypt. Worried that this enterprise is in danger, a man named Baldabiou convinces Herve that to ensure a profit Herve needs to go a land that is known for only being at the end of the world: Japan. But Japan is closed to outsiders. In fact, it is closed off to anyone who leaves the island. Now, it would have been easy for the author, Alessandro Baricco, to bombard the reader with fascinating details about the politics of Japan, and the history of opening the island to outsiders. I would have really liked that. But Baricco had other ideas. He knew that if he heaped detail upon detail, during this part, the mystery and intrigue of the story would become lost. Instead, Baricco uses only the least bit of detail to convey such a tumultuous time of Japanese and world history. And it is done in such a beautiful and remarkable way that this reader never felt as if important aspects of the novel were only glazed over. Okay, I know the past two paragraphs have been cryptic, I apologize. I hate when other reviewers do that, but it seems secrecy is the only way I can explain how powerful this story is. You see, the love Herve thinks he feels is not really love; it’s not not really love as well. And this is the beauty of Baricco’s storytelling. At only a 112 pages, this is an easy read. But when you have finished the story, I am willing to bet it will be a long time before the images and situations leave your mind. This read was a nice break after reading long books. Silk reads like a gauzy flowing breeze. An almost fairy tale with the exotic as background and with travel and some suspense as some of its most palpable elements, it is a not an easy book to put down, precisely because it is so easy to read. The next short chapter with big print draws you immediately in until you suddenly reach the end. As a tale it also has an element of the oral tradition, with periodic repetitions to help its audience remember, repetitions which have bothered some readers, but which for me made the reading faster. It also has some historical pegs, such as 1861 and Abraham Lincoln and the American Civil War, or the effects of the earlier Treaty that Commodore Perry forced on Japan to open up its borders to Western Trade, or the geopolitical setting of an Asia as the theatre for the colonial wars between the various European powers, when the UK was selling arms to the Japanese government, while the Netherlands supported the rebels as the Japanese civil war erupted. We are also reminded of the opening of the Suez Canal, and more pertinent to the tale, the scientific discoveries of Pasteur related to parasites and silkworms. This was the age when a new explosion of trade changed the nature of the already long established Silk-Route. But the historical content is just pegs. A different context could have also served for these historical components seem no more than a setting made of cardboard planks. The narration is not factual, but essentially evocative. The language comes across in a poetic mode in the Spanish translation from the original Italian. Many sentences are left open and others are placed here or there, as if they were loose brushstrokes painted with Japanese ink. Seda or Silk, then comes across as a lyrical legend in which the underlying feeling or theme would seem to be Love. But to me it expressed the more general sentiment of Longing, the longing that is experienced in love, but also in other imaginary trips and landscapes and desires and yearnings. Because Longing is as slippery and shiny and as smooth as silk. Ordine, prego! Silenzio in aula. Silenzio, prego (due colpi col martelletto). La Corte di Giustizia si riunisce oggi per decretare l’assoluzione o la condanna a pena da stabilirsi per il signor Baricco Alessandro, classe 1958. Tra i capi d’accusa imputati al signor Baricco, ricordiamo: “faciloneria”, “faccia da ruffiano”, “spocchia”, “ammiccamenti al lettore”, “egocentrismo ovvero il gusto dell’autocitazione”, “sinteticità”. La difesa del signor Baricco si avvale della facoltà di produrre testimoni a suo favore. Entri il primo testimone! Signorina, si sieda. Vuol dirci come si chiama? Signorina Pagliochini, giura di dire la verità e soltanto la verità? Questa è un’aula di tribunale, signorina. Voglia fare in modo di non porre limiti al suo possibile. È il motivo per cui siamo qui, signorina. Per sbrogliare queste controversie. Voglia riassumere innanzitutto a favore della giuria i contenuti di questo libello, questa sorta di… cartiglio, se così vogliamo chiamarlo. Insomma, questo coso (sbatte la copertina di “Seta” sulla cattedra). La prego, innanzitutto, di chiarircene la natura. Proprio così. Dovesse classificare questo coso (percuote di nuovo la cattedra con “Seta”) che definizione ne darebbe? È un romanzo breve, un racconto, una lista della spesa? Può portare altre evidenze della natura fiabistica di questo scritto? Pura e semplice, eh? E così per lei la narrativa dovrebbe essere tutta pura e semplice? E l’impegno letterario? E il comunicare messaggi forti dove lo lasciamo? Lo scuotere il lettore fin nelle viscere, il cambiargli la vita non interessa più a nessuno? Non dovremmo dare il buon esempio ai giovani scrittori d’oggi? Quindi lei sta dicendo che il signor Baricco non vuole… comunicare nulla? Lei ci sta dicendo che scrive per il gusto puro di scrivere e non per far passare dei messaggi? E lei non pensa che sia proprio questo il motivo per cui la qui presente Corte debba condannarlo? Ma condannarlo pur bisogna, se non vuol dire niente! « Vuol dire esattamente quello che dice. Vuol dire che c’è un uomo che parte per un paese lontano come il Giappone e quel paese lo avvelena. Vuol dire che si innamora di una donna che non gli dice mai nulla, se non “Tornate, o morirò”. E non è la cosa più bella che qualcuno possa dirci? “Tornate, o morirò” significa consegnare alla persona che amiamo il potere di decidere della nostra vita e della nostra morte. Vuol dire che si possono amare due donne contemporaneamente o amare la stessa donna scissa in due persone. Vuol dire che per la persona che amiamo siamo disposte a diventare “l’altra donna”. Mi dica se questo non è commovente, mi dica se non l’ha fatta piangere. Vuol dire che si può essere spettatori passivi della propria vita (“Pioveva la sua vita, davanti ai suoi occhi, spettacolo quieto”) eppure ritrovarsi a osservare eventi che non si comprendono (“Ogni tanto, nelle giornate di vento, scendeva fino al lago e passava ore a guardarlo, giacché, disegnato sull’acqua, gli pareva di vedere l’inspiegabile spettacolo, lieve, che era stata la sua vita”). Vuol dire che certi messaggi possono passare solo attraverso una penna, attraverso caratteri arcaici, mai attraverso le labbra. Vuol dire che si può fare l’amore anche con le parole scritte. Vuol dire che sì, “siamo tutti meravigliosi, e facciamo tutti schifo”. Signorina, la Corte conosce già il testo da lei citato. Voglia fare il favore di non indulgere in simili romanticherie. Non saranno utili all’imputato più di quanto il suo libello lo sia per noi. Così lei pensa che la letteratura non debba essere utile? La prego, signorina, voglia accomodarsi. Che l’accusa produca il suo primo testimone. FUORI DI QUI. Voglia accomodarsi, ho detto. E subito! I have a tendency to picking up doom and gloom books. But not this time, not this time. Silk evoked images of distant Japan and the girl which eyes did not have an oriental slant ; elicited thoughts about things that couldn't happen and made me ponder over pain of longing and power of patience. Beguiled me with its ephemeral beauty and deceptive simplicity and I’m not even sure what it was. Was it a fable with its repetitive phrases and unreal aura? Was it a parable of human life with all its ambitions and failures? Or maybe just an unattainable dream? Whatever it was it was charming. Beautifully written, surrounded by a veil of mystery, fragile like silkworms eggs and delicate as silk thread. Very briefly: After seeing the unfortunate, movie tie-in edition’s cover, I had an Oh-No! It’s a Romance moment. So I read, disregarding the cover, defiantly at times. And I read. Read more. And all of the sudden, the airiness of the text, the nice use of iteration and variation, and as much as I hate to say, the plot, began working in my favor. Quotes won’t really do for this one, at least not quotes of the sort I like to liberate. It’s the absence of text, the lightest hint of language, that makes it work so well. Comfortable language, cozy, gentle. If you wondered, it’s not a Romance, not really, it’s merely romantic. I finished this in a matter of hours. My advice on this book would be: do not let that, nor its slim size, nor the whispering, simple voice that it adopts, fool you into thinking that it is insubstantial in any way. The end got to me even after my short acquaintance with the book. At times, it may feel as if you don't understand the significance of each passing "I never even heard her voice." It was 1861. Flaubert was writing Salammbo, electric light was still a hypothesis and Abraham Lincoln, on the other side of the ocean, was fighting a war whose end he would not see. Herve Joncour was thirty-two years old. I don't want to write a long review, scrutinizing the plot or the characters motivations. The beauty of this prose poem lies in its minimalist brush strokes. Barrico eliminates everything that is extraneous, superfluous or simply unnecessary until only the core of beauty and kindness is left to grace the page. Silk is a celebration of love, adventure and storytelling. It is intimate and sad and in the end it ask a question about what we want to be remembered for? A garden for the children to play in ... A tale of journeys to far places and of dangerous pursuits ... a silk veil so fine it is almost transparent, tranforming the world seen through it into a space for dreams. In time he began to yield to a pleasure that in the past he had always denied himself: to those who came to see him, he recounted his travels. Listening to him, the people of Lavilledieu learned about the world, and the children discovered what marvel was. He spoke softly, staring into the air, at things the others couldn't see. - "The Unbearable Lightness of Being" would be a great title for this story, if only Milan Kundera didn't already owned it. - No point in seeing the movie. The reviews are consistently negative. Too bad, because this whimsical tale should have worked well by the producers of 'Amelie' or by Tornatore. - soundtrack listing : Sting "Fragile"
- soundtrack listing : Terence Trent D'Arby "Delicate"
Credo ormai di aver compreso che Baricco sia uno di quegli scrittori privi di vie di mezzo, per quanto riguarda il loro rapporto con il lettore: o piace, o non piace. E credo anche di aver capito che io rientro decisamente nella prima categoria. Come per gli altri scritti, è difficile per me scrivere una recensione di Seta. Ciò che i libri di Baricco mi lasciano è qualcosa di indefinito e informe, e che tuttavia è in grado di rimanere nel mio cuore per sempre. È come se la narrazione avvenisse so Credo ormai di aver compreso che Baricco sia uno di quegli scrittori privi di vie di mezzo, per quanto riguarda il loro rapporto con il lettore: o piace, o non piace. E credo anche di aver capito che io rientro decisamente nella prima categoria. Come per gli altri scritti, è difficile per me scrivere una recensione di Seta. Ciò che i libri di Baricco mi lasciano è qualcosa di indefinito e informe, e che tuttavia è in grado di rimanere nel mio cuore per sempre. È come se la narrazione avvenisse sottovoce, lentamente, mirando direttamente all'intima essenza del lettore. E se in Oceano Mare il sottofondo era quello dello sciabordare delle onde, qui è il fruscio della seta di Lavilledieu, il canto degli uccelli nella voliera in Giappone, il dialogo muto tra gli sguardi di Herbé Joncour e la donna con il viso da ragazzina, ma anche e soprattutto l'amore di Hélène, così potente. Una carezza sulla pelle, un battito di palpebre, una sensazione nel profondo dell'anima. Como el tacto de la seda, esta novela está relatada con una sutileza y una sensualidad que encandilan al lector desde las primeras líneas. Suave, a ritmo acompasado, con delicadeza pero con soltura, vamos conociendo la historia de nuestro protagonista, Hervé Joncour. Y cuanto más nos vamos adentrando en la historia más aspectos de su vida conocemos. Lavilledieu era el n Magnífico, espectacular, sublime. Este joven francés, por requerimientos del oficio y debido a los daños que las epidemias afligían, con cada vez más intensidad y frecuencia, a los cultivos situados en las tierras europeas, se ve inmerso en largos viajes en busca de gusanos de seda sanos que llevar de vuelta a Lavilledieu. Esta parte aventurera de su trabajo lo lleva, después de agotar todos los recursos, a embarcarse en un viaje a un lugar lejano, inhóspito y totalmente desconocido, en busca de los ansiados y tanto necesitados, gusanos de seda. - ¿Y dónde queda, exactamente, el tal Japón? - Siempre derecho hacia allá. Hasta el fin del mundo. Atraviesa el país, el continente y hasta más de medio mundo para toparse con una cultura diferente, chocante, hermética, para llegar a una casa, dentro de una región en aquel remoto país en el que destaca una sola cosa, que lo encandila, lo fascina y lo deslumbra. Hervé Joncour no dejó de hablar, pero bajó instintivamente la mirada hacia ella y lo que vio, fue que esos ojos no tenían un aspecto oriental y estaban clavados, con una intensidad desconcertante, en él. Seda, en cuyas páginas nace, crece, vive y se entrelaza una bellísima historia de amor que vive, crece y ahonda en las almas lectoras, envuelta de una sensualidad tal, solamente comparable con el delicado y sutil tacto de la seda. Amor prohibido, pasión a mares, sensualidad desbordante, sentimiento a flor de piel, todo esto y más reviste y emana de las poco más de 100 páginas de esta obra literaria de procedencia italiana que nos lleva desde Francia a Japón travesando así medio mundo para culminar dejándonos en herencia una de las cartas de amor más maravillosas jamás escritas al lado de nuestro corazón en un puño afligido y hecho pedazos. hasta que al final te bese en el corazón porque te quiero, morderé la piel que late sobre tu corazón, porque te quiero, y con el corazón entre mis labios tú serás mío, de verdad, con mi boca en tu corazón tu serás mío para siempre, y si no me crees abre los ojos señor amado mío y mírame, soy yo, quién podrá borrar jamás este instante que pasa, y este mi cuerpo sin más seda, tus manos que lo tocan, tus ojos que lo miran. "The year is 1861. Hervé Joncour is a French merchant of silkworms, who combs the known world for their gemlike eggs. Then circumstances compel him to travel farther, beyond the edge of the known, to a country legendary for the quality of its silk and its hostility to foreigners: Japan.There Joncour meets a woman. They do not touch; they do not even speak. And he cannot read the note she sends him until he has returned to his own country. But in the moment he does, Joncour is possessed." “And a "The year is 1861. Hervé Joncour is a French merchant of silkworms, who combs the known world for their gemlike eggs. Then circumstances compel him to travel farther, beyond the edge of the known, to a country legendary for the quality of its silk and its hostility to foreigners: Japan.There Joncour meets a woman. They do not touch; they do not even speak. And he cannot read the note she sends him until he has returned to his own country. But in the moment he does, Joncour is possessed." It is so hard to write a review about books that have such a strong emotional impact as SILK does. I still feel like I am in a trance and while it may be easier to wait until it all settles down a bit, but at the same time it may prove too difficult to communicate all the feelings this book evokes in me. I have read it now for the second time after more than 10 years, but it had the same effect. IT IS MESMERIZING. IT IS SEDUCTIVE. It beckons with its deceptive simplicity and yet you feel that this simplicity may hide depths and layers. Its style is almost bare, without colours, without sounds. There are no descriptions. There are short sentences, more like statements, but they still entangle you in their web. It's a skeleton and you can take it as it is or try to flesh it out. However, at the very end, which took my breath away, I was suddenly forced to flesh it out and to read the whole story again with THAT ENDING in mind. I read this in almost one seating while waiting at the hairdresser. A much better choice than the gossip magazines that were scattered around the place. Este es mi primer libro que leo de Alessandro Baricco. Seda es una novelette de capítulos muy cortos, minimalista y con una narración que se me hizo directa y, en su mayor parte, superficial, ya que se dejó de lado un recurso que considero muy valioso: la autorreflexión. De todas maneras, es un libro entretenido, que se lee rápido y, a pesar de que ni los personajes ni la historia me terminaron de convencer, lo recomiendo para una tarde aburrida. Storia di viaggi per mare, di treni a vapore, di un uomo che narra la propria vita come mai prima d'allora. E nelle pagine echeggia la voce di Hélène, mentre nell'aria si diffonde il profumo dei gelsomini. "Questo non è un romanzo. E neppure un racconto. Questa è una storia. Inizia con un uomo che attraversa il mondo, e finisce con un lago che se ne sta lì, in una giornata di vento. L'uomo si chiama Hervé Joncour. Il lago non si sa. "Un libro con l'incanto di una fiaba, narrata da uno dei miglior Storia di viaggi per mare, di treni a vapore, di un uomo che narra la propria vita come mai prima d'allora. E nelle pagine echeggia la voce di Hélène, mentre nell'aria si diffonde il profumo dei gelsomini. "Questo non è un romanzo. E neppure un racconto. Questa è una storia. Inizia con un uomo che attraversa il mondo, e finisce con un lago che se ne sta lì, in una giornata di vento. L'uomo si chiama Hervé Joncour. Il lago non si sa. "Un libro con l'incanto di una fiaba, narrata da uno dei migliori affabulatori esistenti. 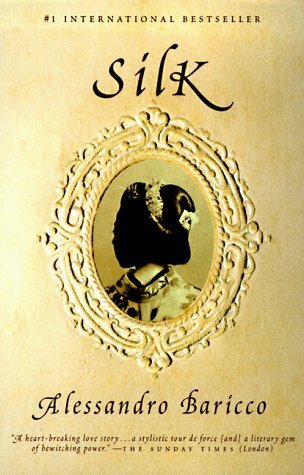 Silk (Italian: Seta) is a 1996 novel by the Italian writer Alessandro Baricco. It was translated into English in 1997 by Guido Waldman. A new English translation by Ann Goldstein was published in 2006. The novel tells the story of a French silkworm merchant-turned-smuggler named Hervé Joncour in 19th century France who travels to Japan for his town's supply of silkworms after a disease wipes out their African supply. His first trip to Japan takes place in the Bakumatsu period, when Japan was still largely closed to foreigners. During his stay in Japan, he becomes obsessed with the concubine of a local baron. His trade in Japan and his personal relationship with the concubine are both strained by the internal political turmoil and growing anti-Western sentiment in Japan that followed the arrival of Matthew C. Perry in Endo Bay. Una historia melancólica, triste, sutil, evocadora. "He wasn't much cut out for serious conversations. And a goodbye is a serious conversation." OK, for 125 pages I'm reading this thinking, "three stars, nice little story, fast read; wish more novelists could tell a sweeping romantic adventure tale with such dispatch. Vivid, enjoyable, and even educational, but no great shakes." And then I get to the end, and realize the power of the wife's desire. What she does. How he realizes what she did, and how she had felt. How she knew about his inner life, and didn't want to be a surrogate. Goddamn it hit me hard. Made me cry, it did. I'm trying to say why it was good without being too specific and giving much away. Kartais mano knygų skaitymas atrodo lyg grandinėlė- vienas kūrinys nuveda į kitą arba susišaukia temos. Tarsi kokia magija! Taip atsitiko ir su “Šilku”. Šis kūrinys jau seniai buvo mano planuojamų perskaityti knygų sąraše, bet vis atidėliojau. Tikriausiai dėl baimės nusivilti, nes tiek pačių gražiausių atsiliepimų girdėjau. Taip nenutiko- šis kūrinys vertas visų liaupsių. Literatūros pasaulyje apie šią knygą sklando tie patys epitetai: įspūdinga, meistriška, talpi, taupi. Kiekvienas epitetas ties Kartais mano knygų skaitymas atrodo lyg grandinėlė- vienas kūrinys nuveda į kitą arba susišaukia temos. Tarsi kokia magija! Taip atsitiko ir su “Šilku”. Šis kūrinys jau seniai buvo mano planuojamų perskaityti knygų sąraše, bet vis atidėliojau. Tikriausiai dėl baimės nusivilti, nes tiek pačių gražiausių atsiliepimų girdėjau. Taip nenutiko- šis kūrinys vertas visų liaupsių. Literatūros pasaulyje apie šią knygą sklando tie patys epitetai: įspūdinga, meistriška, talpi, taupi. Kiekvienas epitetas tiesa. Kūrinys vos 100 puslapių, atrodo, jog kiekvienas žodis pasvertas. Tarsi chirurgo skalpeliu Baricco labai preciziškai parenka kiekvieną žodį ir parodo, koks išties talpus gali būti vienas vienintelis žodis. Knyga melodinga, kiekvienas žodis vilnija ir glosto tarsi tas šilkas. Užsiminiau apie kūrinių tarpusavio susišaukimą. Gal kiek netikėtai, bet “Šilkas” susišaukia su mano prieš tai skaityta “Sekso aušra”. Jose abejose kalbama apie galimybę mylėti daugiau nei vieną žmogų. Tikrai daug apmąstymų. Kita tema- meilė plačiąja prasme. Kaip žmogus ją išgyvena, kaip eina per gyvenimą ir kokią įtaką ji daro sprendimams. Although his father had pictured for him a brilliant future in the army, Hervé Joncour had ended up earning his crust in an unusual career which, by a singular piece of irony, was not unconnected with a charming side that bestowed on it a vaguely feminine intonation. Hervé Joncour bought and sold silkworms for a living. The year was 1861. Flaubert was writing Salammbo, electric light remained hypothetical, and Abraham Lincoln, beyond the Ocean, was fighting a war of which he was not to see the Although his father had pictured for him a brilliant future in the army, Hervé Joncour had ended up earning his crust in an unusual career which, by a singular piece of irony, was not unconnected with a charming side that bestowed on it a vaguely feminine intonation. Hervé Joncour bought and sold silkworms for a living. The year was 1861. Flaubert was writing Salammbo, electric light remained hypothetical, and Abraham Lincoln, beyond the Ocean, was fighting a war of which he was not to see the finish. Hervé Joncour was thirty-two. He bought and sold. This novella captures one’s imagination from the first chapter. It took me a while to understand why even though the work is so short. In fact this is the only time in my life that when I have finished a book, I have pounced on the person nearest to me and insisted that he/she read it. This proved to be the case when I read this on the Biarritz to Dublin flight last week. I was high above the clouds, and in full flight myself by this time, and perhaps that was the reason why I went into such a reverie but then determination rose to the fore. The gentleman sitting next to me was reading a scientific paper and did not take kindly to me when I asked him straight away was he a reader. A reader of what genre was his somewhat disdainful reply. Fiction in this instance, contemporary Italian fiction, was my immediate response. Well I then thrust “Silk” under his nose; in fact I nearly knocked off his glasses. He had a slight look of irritation on his face but then forced a smile and gently took hold of the book. He read the fly cover and taking a small notebook out of his pocket, wrote down the title of the book and the name of the author. Now whether he will ever read the book I don’t know. But I do believe that I pointed him in the right direction. My next contact was Mary, who I was staying with. I had no idea what kind of books she read but she promised me that she would read it that evening and the next morning we sat down, with her husband John, and discussed the book. He was actually quite put out that we were talking about a book instead of the serious business of eating breakfast and planning our day. But what is interesting is that my friend’s view of the book was completely different to mine. Mary had read it quickly and concluded that it was a light read and then she brought up several questions that made the pair of us look through the book again. We had differing opinions, especially on the letters and the two aviaries. This style of writing is quite unknown to me. The sixty-five chapters are short and punchy and yet they resonated with me. In fact chapter 49 consisted of only four very short sentences. The contents of the book appear to give off a lambent glow for some obscure reason. It’s a book of movement and yet also stillness and light. Also there are repetitions with the four journeys to Japan, the only difference being that Lake Baikal is known locally as “the sea” on one trip, then “the demon” on the second, on the third occasion there was no mention and finally on the fourth trip known as “the holy”. Was there a symbolic meaning here that I could not understand? Of course at the beginning the book is mainly about obtaining the eggs for a fresh breeding of silkworms as there is an epidemic of “pébrine” (“the spotted disease in silkworms which had made the eggs from European hatcheries unfit for use and which had spread, some said, as far as India”) that threatened to destroy the silk industry in France. Joncour (a Frenchman) is thus charged by Baldabiou with going to Japan at the other end of the world in this quest to find the eggs. When you consider that Japan was closed to foreigners at that time and was a particularly dangerous place to be in (many went there and were never to return), it took a great deal of courage for an individual such as Joncour to attempt to travel there. Her eyes did not have an oriental slant, and her face was the face of a young girl. It was the aviary that Hara Kei had that intrigued me. It was full of exotic birds and then one day the concubine lets them out. Was this symbolism in that if one loves someone/something, one can let them go and know that they will ultimately return? Yes the birds did return. And then Joncour decides to build an aviary in France. Why? But the fascination he has for the concubine and she for him is the foundation of this novella. They do not speak but manage to communicate via letters that have to be translated and then… Well you have to read the book. Wondermooi! Een teer en verdrietig verhaal over liefde en verlangen. Het is prachtig hoe Rébecca Dautremer dit verhaal van Alessandro Baricco zo zacht en subtiel heeft geïllustreerd, tegelijkertijd haar eigen verhaal vertellend, bijzonder hoe dat elkaar aanvult... Ze heeft een magisch realistische tekenstijl en de Japanse kunst uit die tijd is hier zo ontzettend fraai in verwerkt (het verhaal speelt zich af vanaf 1860, in Frankrijk en Japan). Voor wie even wil spieken is hier een link naar een pa Wondermooi! Een teer en verdrietig verhaal over liefde en verlangen. Het is prachtig hoe Rébecca Dautremer dit verhaal van Alessandro Baricco zo zacht en subtiel heeft geïllustreerd, tegelijkertijd haar eigen verhaal vertellend, bijzonder hoe dat elkaar aanvult... Ze heeft een magisch realistische tekenstijl en de Japanse kunst uit die tijd is hier zo ontzettend fraai in verwerkt (het verhaal speelt zich af vanaf 1860, in Frankrijk en Japan). هناك قصيدة في بطن كل حكاية. ما يفتننا في الحكاية أصلا هو تلك القصيدة الصغيرة المتكورة في بطنها، القصيدة التي تحتوي العالم كله، داخل بطنها أيضاً، العالم الذي يتشنج ويتكثف ويقذف في قلوبنا بغتة دون أن ننتبه. رواية «حرير» لأليسندرو باريكو هي واحدة من تلك الأعمال التي تتحرك في جغرافيا وسيطة بين السرد والشعر، حيث الكلمة كائن حر يتأرجح بين العالمين الكتابيين الملتبسين، ثمة بساطة استثنائية ومباشرة في سرد الوقائع وتلاوة الأحداث، مثل قوله «هيلانة هو اسم زوجته، لم ينجبا أطفالاً»، وثمة غنائية واضحة في ترديد هناك قصيدة في بطن كل حكاية. ما يفتننا في الحكاية أصلا هو تلك القصيدة الصغيرة المتكورة في بطنها، القصيدة التي تحتوي العالم كله، داخل بطنها أيضاً، العالم الذي يتشنج ويتكثف ويقذف في قلوبنا بغتة دون أن ننتبه. رواية «حرير» لأليسندرو باريكو هي واحدة من تلك الأعمال التي تتحرك في جغرافيا وسيطة بين السرد والشعر، حيث الكلمة كائن حر يتأرجح بين العالمين الكتابيين الملتبسين، ثمة بساطة استثنائية ومباشرة في سرد الوقائع وتلاوة الأحداث، مثل قوله «هيلانة هو اسم زوجته، لم ينجبا أطفالاً»، وثمة غنائية واضحة في ترديد مقاطع معينة من الرواية بما يشبه ما نقرأه في قصص الطفل، أو مداخلات (الكورس) في النصوص المسرحية، ففي كل مرة يمضي فيها بطل الرواية «هيرفيه جونكور» للسفر، يقدم لنا الراوي شرحا مفصلا عن الطريق في صفحة كاملة: «اجتاز الحدود بالقرب من مدينة ميتز، وقطع ورتمبرغ وبافاريا، دخل إلى النمسا، ووصل بالقطار إلى فيينا ومن ثم إلى بودابست وتابع سيره حتى كييف» وحتى آخر الرحلة، يقوم البطل خلال الرواية (وخلال حياته أيضاً) بثلاث رحلات، وفي كل رحلة يعاود الراوي شرح المدن التي عبرها والحدود التي اجتازها، وهو يقوم بذلك جزئياً، لكي يؤكد على العناء الذي تكبده بطله المسافر، وأيضاً لأن التكرار هنا، يخدم غنائية العمل الروائي، ويجعله السرد عامراً بالدندنة، والهمهمة، والرنين، ويسبغ على العمل -بزعمي- صبغة مثيولوجية وملحمية، إذ غالباً ما تتضمن النصوص الملحمية تكراراً لمقاطع معينة. إذاً، الرواية -بحسب رأيي- تتقاطع مع الشعر، والمسرح، والأغنية، وأضيف هنا: ومع السينما أيضاً، لأن العفوية الملفتة التي يتحرك بموجبها السرد تجعل من المتلقي متفرجاً أكثر منه قارئاً، فعلى سبيل المثال نجد أن الرواية تبدأ على النحو التالي: «بالرغم من أن والده تنبأ له بمستقبلٍ لامع في الجيش، إلا أن الأمر انتهى بهيرفيه جونكور، بأن يكسب قوته، بفضل مهنة شاذة، لم تكن غريبة عنها -ولسخرية القدر- تلك السمات المحببة التي تنم، جيداً، عن انعطافة نسائية ملتبسة. كي يعتاش، كان هيرفيه جونكور يشتري دود القز، ويبيعه. نحن في العام 1861. فلوبير يكتب روايته «سالامبو» والإنارة الكهربائية لم تكن بعد سوى فرضية، بينما أبراهام لنكولن، وعلى الطرف الآخر من المحيط، يخوض حربا لا يعرف متى نهايتها. يبلغ هيرفيه جونكور الثانية والثلاثين من العمر. يشتري ويبيع .. دود القز». زمن الرواية هو الحاضر دائما، حتى لو كان في الماضي، وعوضاً عن أن يقول الراوي «كان ذلك في العام 1861» فهو يقول «نحن في العام 1861» وهو التعبير الأقدر على القبض على سفرنا عبر الزمن، ولفظة «نحن» هنا تماهي بين الراوي والمتلقي، وتورط القارئ بالعالم الروائي الذي يتفتح أمام عينيه، وتجعل شخوصه أكثر محسوسية وحضوراً، أنا شخصياً وجدت أن الكاتب «كريم جداً» معي كقارئة بمنحي معيّته! I had heard so much praise about this little book: after spending a snowy morning in reading it, I have to confess I feel underwhelmed. The beauty of the language is undeniable. It was originally written in Italian: I read a French translation, and the delicate rhythm of the sentences is quite lovely. The use of repetition obviously tries to make the narrative poetic and dream-like, and it succeeds... up to a point. To be honest, I found it a wee bit cliché: in 1860, a French silk worm merchant tr I had heard so much praise about this little book: after spending a snowy morning in reading it, I have to confess I feel underwhelmed. 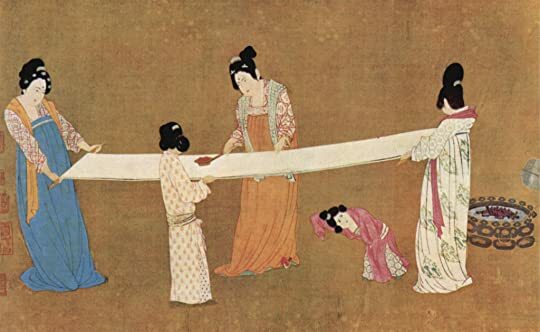 To be honest, I found it a wee bit cliché: in 1860, a French silk worm merchant travels to Japan after an epidemic contaminates the more easily acquired silk worm eggs of the Middle East. There he meets a woman and after exchanging a glance, they are in love and he must find a way to go back and be with her. I can see how some people would find this wildly romantic and fairy-tale like. I'm sure such a story would have made a perfect Scheherazade fable, but it did not move me half as much as I had expected. Don't get me wrong: it is a charming little book! But it is incredibly superficial: there's no character development, no description of the marvels encountered by our main character during his exotic travels, nothing! Some might argue that it is not the point, and they would not be wrong, but I like my love stories with a little meat around the bone (no pun intended). این کتاب بر اساس فراز و فرودهای یک سمفونی نوشته شده. من رو از هفتاد درصد به بعد شدیدا جذب کرد. مشکل از من بود که جذبش نشده بودم البته. وقتی که حوصله ی یک داستان سورئالیستی رمانس دارید بخونیدش، ناامیدتون نمی کنه. "E' uno strano dolore, morire di nostalgia per qualcosa che non vivrai mai." Prima di questo ho letto Oceano mare, libro che, devo ammettere, non ho apprezzato più tanto. E inizio a pensare che il problema sia mio. Dopo Seta, continuo imperterrita a non capire Baricco. Lettura piacevole, per carità, ma non ti lascia nulla. Dicono che nei libri di Baricco non si deve prestare attenzione alla storia, ma a ciò che la storia vuole comunicare. Come la mettiamo se la storia non comunica niente? Ti sciv "E' uno strano dolore, morire di nostalgia per qualcosa che non vivrai mai." Ti scivola addosso, come seta. L'unica cosa degna di nota è la frasetta sopracitata. فرم قصه، که تیکهتیکه و کوتاه بود باعث میشد کتاب خستهکننده نباشه و به جزئیاتِ نامهم نپردازه. خود داستان هم خوب بود. گاهی انتظارت رو بالا میبرد و بعد ناامیدت میکرد. میتونست بهتر باشه. گاهی هم خیلی خوب میشد و سفیدی و بیچیزی فضای ژاپن و ساکتیش رو خوب میرسوند. پایان خوبی هم داشت. در کل خیلی جذاب بود که نویسندهای ایتالیایی از ژاپن بنویسه! سه و نیم ستاره. فرم قصه، که تیکه‌تیکه و کوتاه بود باعث می‌شد کتاب خسته‌کننده نباشه و به جزئیاتِ نامهم نپردازه. خود داستان هم خوب بود. گاهی انتظارت رو بالا می‌برد و بعد ناامیدت می‌کرد. می‌تونست بهتر باشه. گاهی هم خیلی خوب می‌شد و سفیدی و بی‌چیزی فضای ژاپن و ساکتی‌ش رو خوب می‌رسوند. پایان خوبی هم داشت.